The Blue Jay announces its presence with its typical jay-jay-jay call (he says his name). Blue Jays have many different calls – some calls warn other birds about predators (either aerial or on the land) in the neighborhood. 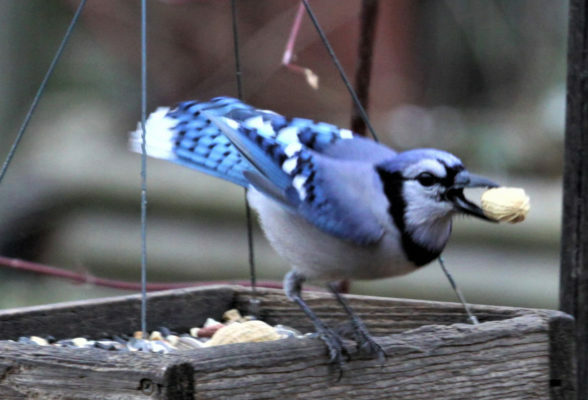 Blue Jays will grab seeds or peanuts from a feeder and will either eat it or fly away and cache it for later. If there is an owl in the vicinity, the jays will ‘mob’ the owl until it flies away. We have four Blue Jays that come to our feeder for peanuts every day. I do enjoy watching them.